1. Stir together flour, soda, salt, cinnamon and nutmeg. Set aside. 2. In large-size mixing bowl beat margarine and sugar until light and fluffy. Add egg beat well. Mix in cereal. Add dry ingredients alternately with milk beat well after each addition. Gently fold jam into batter. Do not beat. Portion batter evenly into paper-lined 2 1/2-inch muffin-pan cups. 3. Bake at 400°F about 20 minutes or until tests done. Serve warm. 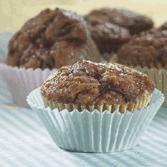 This Bran Jam Muffins recipe is from the Kellogg Kitchens Recipes Cookbook. Download this Cookbook today.